recruitment are 380 posts. Willing Candidate possesses prescribed qualifications have to apply for FCI Watchman Jobs using the online web portal @ http://www.fciharapply.com/. Application forms available from 05-11-2017 (10 AM) and closed in 04-12-2017. For Watchman Jobs candidate required to pass 8th class and the age limit should be 18 years to 25 years as on 01-08-2017. For erstwhile Contractual Security Guards Upper Age limit is 55 years as on 31-05-2018 and educational qualification is 5th standard pass. Haryana FCI Watchman Jobs recruitment selection is based on written examination marks. Selected candidates will be paid Rs. 8100/- to Rs. 18,070/- per month. 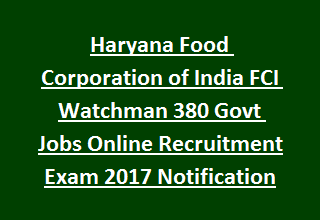 For more queries of Food Corporation of India, Haryana Watchman Jobs Recruitment Notification 2017, Please see the official notification. Post Name: Watchman: 380 posts. OUT of 380 posts, 11 posts for PwD, 93 for Ex- Serviceman. Minimum educational qualifications for Watchman Jobs is Middle Standard Pass (8th Class) from recognized board. Pay Scale for Haryana FCI Watchman jobs is Rs. 8100/- to Rs. 18,070/- per month. Candidate should have minimum age should be above 18 years and maximum age limit is below 25 years as on 01-08-2017. Relaxations in age applicable for SC/ ST candidates is five years, for OBC candidates is three years and for PH candidates ten years. For erstwhile Contractual Security guards maximum age limit is 55 years. Application fee for general candidates is Rs. 300/- plus Transaction charges. For SC/ ST/ Woman/ Service Defence Personnel/ PWD/ Ex Serviceman candidates application fee is nil. Recruitment Watchman jobs in FCI, Haryana Recruitment is based on written Test and Physical Endurance Test. i. Written test consists of MCQ type questions, cover the topics of General Knowledge, General Awareness, English Language, Current Events & Numerical Ability, Aptitude consisting of Reasoning. Question paper will be in both English & Hindi. Eligible candidates have to go through the FCI official notification http://www.fciharapply.com/. Read the instructions and fill the application form. Closing date for submission of FCI Haryana Application form is 04-12-2017. Apply online for Haryana FCI Watchman Jobs Recruitment Notification 2017.